Record-breaking droughts, fruit flies that survive unusually mild winters to ravage in the spring, and pathogen outbreaks, like the one in Puglia that has claimed more than a million olive trees. It might seem like climate change could spell the end of the olive oil world, but not so fast, says Luigi Ponti, a research scientist at Italy’s National Agency for New Technologies, Energy and Sustainable Economic Development. His research on the effect of warmer temperatures on the olive sector has been published in scientific journals and provides a valuable framework for continued studies on this important topic. And like so many complicated issues, when we ask, what will climate change mean to olive oil producers around the world? The short answer is: well, that depends. Curtis Cord Record breaking droughts, fruit flies that survive unusually mild winters to ravage in the Spring and pathogen outbreaks like the one in Puglia that has claimed more than a million olive trees, it might seem like climate change could spell the end of the olive oil world. “But not so fast,” says Luigi Ponti, a research scientist at Italy’s National Agency for New Technologies, Energy and Sustainable Economic Development and a research fellow at CASAS Global NGO. His research on the effect of warmer temperatures on the olive sector has been published in scientific journals and provides a valuable framework for continued studies on this important topic. Like so many complicated issues, when we ask what will climate change mean to olive oil producers around the world, the short answer is, “That depends.” He joins us today from Rome, Luigi welcome to On Olive Oil. Curtis Cord Your studies result from an international collaboration between ENEA, which includes the laboratory for sustainability, quality and safety of agricultural food production based in Rome, CASAS Global NGO and the University of California at Berkeley. Speaking of international collaborations, just last month one hundred and ninety six countries finally approved after a series of failed attempts in recent years an historic pact to slow the pace of climate change. Were you following the deliberations in Paris? Luigi Ponti Yes. I’ve been following what has been happening in Paris, not just lately but the whole debate that goes on around the UN framework convention on climate change and the series of report that IPCC, the Intergovernmental Panel on Climate Change, has been putting together over the course of the last years. They represent the consensus of the scientific community of what’s going in terms of climate change in both the physical and scientific part. What the effects of it on our planet are and the interaction with the human system and the natural systems. They’ve been looking better over the course of the time at this and our knowledge have improved. If I had to pick the key issue for ecosystems, because agricultural fields are ecosystems in the end, nothing less and nothing more, I think that the key issue here is complexity. When studying ecosystems in general and agriculture ecosystems in particular, the main barrier to understand them, that means the main barrier to manage them, is complexity. Climate change is just another additional level of complexity that is on top of the rest of the biological and physical layers that you have. It makes it harder to manage them because you have certain assumptions based on which you try to manage an olive field for example, an olive grove. Those assumptions are challenged by this change. It was very to the point in your introduction when you said that it depends what the effects are. Curtis Cord Of course one of the results of such an accord is that it paves the way for innovation. There are expected to be a lot more funds allocated for research related to environmental modelling. Just this morning in fact the New York Times editorial urged the following, “As available water and growing seasons shift further and threats of invasive weeds, pests and pathogens rise, now more than ever we need to embrace twenty first century science, fund it and turn it loose so we can develop better methods of putting food on the table. Our world is changing,” the New York Times say, “the way we grow and produce food needs a much richer diet of scientific ingenuity to keep pace.” Luigi do you and the rest of your team have the sense that you’re in the right place at the right time? Luigi Ponti We do, specifically for ENEA, we are a very inter-disciplinary research center that focuses broadly on energy and the environment. Since the beginning we have turned loose on the disciplinary boundaries that usually constrain environmental research in general, at least in Italy this is the case. I think that for climate in general one problem is that there are established ways for the climate science people to look at what happens on a planetary level for the climate system, for example you have a set of global climate models that are being run systematically by the climate community, the climate science community. They make projections on what’s going to happen in terms of the climate system for the future. Based on that they make recommendations that form the basis on which people in Paris discussed, right? Luigi Ponti But for ecosystems that not the case, there aren’t standard ways to look at ecosystems from a scientific point of view. The main barrier, the main constraint is that beyond all the complexity that is embedded in the climate system you would have to represent the complexity of natural systems. It’s very difficult to do and the reports of the Intergovernmental Panel on Climate Change say that very clearly, that when you look at ecosystems the main problem is that you can’t factor in interactions in a mechanistic way. That means you cannot summarize what’s going on in the field when species interact to each other. This is what we have attempted in the study your referred at the beginning of the interview. There’s a bunch of species that we call biodiversity, that interact to each other and with the climate. Each of them have different requirements for growing and developing, reproducing, and the climate affects the way they survive or die. It’s a set of non-linear interactions that it’s difficult to project in the future. Curtis Cord Right. That’s the predictive model based on physiological analogies across the food web, to predict the cost of climate change on olives. Can you explain the model in a way even I can understand? Luigi Ponti The basic idea is to look at every organism as if it were a consumer. In an economic sense you have certain priorities, you have to acquire resources and then once you have acquired those resources you have to allocate them according to a certain priority. It turns out this priority is the same across the food web, regardless of the fact you are an animal, a plant or a top predator, you have the same priorities. What changes is the shape of the mathematical function that describes these processes, but in the essence you can describe any organism at a physiological level with the same model. Acquisition of resources and allocation of those, it would be food or organic matter or for a plant it would be acquiring the light from the sun, then you have to allocate those resources and you do it the same way with the same priorities regardless of the kind of organism you are on this planet. This simplifies, computationally it’s easier to describe the organisms that way. Also it tells you what’s going on by ecological analogy, you kind of know what’s going on in the underlying dynamics. It helps you understand the interactions and the processes that are occurring in the field. Curtis Cord Based on the model’s predictions you and your fellow researchers estimate that with the warming expected by around mid century, olive tree yield will actually increase across the region, the Mediterranean region, by four point one percent. Fly infestation will decrease by eight percent and net profits will increase by nine point six percent on average. These figures are surprising to me. Were you surprised by the findings? Luigi Ponti I was not surprised. The first thing to keep in mind is that this is a scenario analysis, it’s based on a climate scenario which is not a prediction of the future because that’s impossible to get right. But you know that the trend with reason based on the fact that there’s going to be a warming and the daily pattern will change, the climate models tell us the way this is going to happen. We use those data to drive a model of an ecosystem, in this case an olive agroecosystem. I have no assumptions on what’s going to happen in the future so I wasn’t surprised because I knew that the thermal tolerance to temperature is wider for the plant than for the fly so I wasn’t surprised that the plant would do better than the fly does if the climate warms. I wouldn’t be able to tell you without making the analysis what would be the outcome of the interaction of the two, of the plant and the fly, as the climate warms because that entails looking at what happens on a daily basis and season after season because that depends of course, as you said in the beginning, on the fact that the fly survives better or it doesn’t survive from one season to the next over the Summer. That’s a matter of the daily patterns of weather and how it interacts with the plant. That’s why the model is there, because you kind of have an idea of the tolerance to change in temperature of the plant and of the fly, but to get an answer of the trend over an extended period of time based on the daily pattern of weather, you need an analysis tool that reproduces sufficiently well the biology. Then the patterns that came out were not entirely surprising because as biologist, I’m an agronomist, I know that when the weather is very hot in the Summer, I know it’s basically the same as you were treating with an insecticide against the fly. It has the same effect, it kills most of the population of the adult flies. We know that, to see that the fly is not doing good in the southern part of the Mediterranean basin prospectively if the climate warms, it was not surprising. Curtis Cord Why would you think as an agronomist that your model would predict that the yield would increase as temperatures climb? Luigi Ponti That is a matter of a longer growing season. Both the plant and the fly work not on the basis of our regular time scale, which is made of days and hours and minutes, but they work on the basis of physiological time, what we call day-degrees. That means that when it’s warm the biology runs faster, when it’s cold the biology runs less fast and it can arrest development at certain thresholds. That’s why you get a higher yield when it’s warmer, and that of course has a threshold too for the plant, even though it’s higher than for the fly. You see that, in the study, when we look prospectively at the changes in yield, that there are regions in the southern Mediterranean basin where you have actually decreased yields. That’s because in those places you reach a point where the cost, that is basically a cost that the plant sustains because of respiration as the temperature warms the respiration, the metabolic cost for sustaining the metabolism of the plant increases and it cannot be compensated by the increase in the organic matter, dry matter, that is being synthesized, so there is a threshold for the tree too. When it’s too hot it’s not going to be able to increase further the yield. Even if you add irrigation, that’s not going to change it. This is an important consideration in a climate change scenario because the pattern of precipitation or the fact that you get irrigation water will not affect the temperature constraints because at a certain level respiration will be too costly and even a plant like olive, which is drought resistant, it’s taken as probably the model of drought resistant plant in arid climates, at a certain point will close stomata. The plant for synthesizing yield needs to exchange gases with the atmosphere. It needs to get CO2 and to use the energy of light to produce photosynthates that go to the fruit. That will last until it’s too hot. The plant to prevent desiccation, not to die, it has to close the stomata, which is the little holes on the leaves through which the gases exchange occurs. After that point not photosynthesis is possible. There are limits, physiological limits for the plant when climate warms. Curtis Cord Your analysis also predicted that profitability of olive farms in north Africa, we’re talking about Iraq, Algeria, Tunisia, will increase by more than forty percent. How is that possible? Is that from the extended growing period like you said and the inability of the olive fly to withstand hotter temperatures? Luigi Ponti It’s a combination of the extension of the growing season for the olive and the fact that the pest, the olive fly is going to have a hard time. In the bio-economic we built you get a decrease in the cost for controlling olive fly and at the same time you get increased yields. That’s why you get higher profit in the end. This is the basic dynamics that drive the profit analysis that we made. Depending on the fact, whether the climate pattern you get in the future favors or not yields and makes you spend more money on controlling the fly or not, in the end you get an increased or decreased profit. Curtis Cord You’re analysis looked at the interactions between the olive fruit fly and the olive tree as driven by the weather, but aren’t there other variables that your study did not include? For example studies predict that the summers in southern Europe will be drier as temperatures rise with longer dry spells, that would lead I’d imagine to a need for more irrigation of olives which would have a corresponding cost to farmers. Luigi Ponti Right, that’s right. There’s a lot of variability on the ground. The way we address that, because it was not possible to reproduce via modelling all that variability or all that complexity that you find on the ground because you have different varieties, you have different planting densities, you have places where they give supplemental irrigation, places where they don’t. There’s a lot of different soil type, soil depth and all these kind of things that make the system so complicated, and in addition to that there’s no data that allowed us to simulate that complexity, we took agricultural statistics, which is basically a map that was put together using data from FAO, the Food and Agricultural Organization of the United Nations, that collects agricultural statistics worldwide. They used a seven year period of yield records and they put it georeferenced, it means that on a grid that I think was five kilometers or so, they tell you what fraction of the land is covered by olive and what’s the average yield. In that number you get embedded all the things that I said before, planting density, the way the cultural practices and varieties. We use that as a basis that we scaled with the projections that we got running the model in the future with the climate change scenario. That way we try to overcome this limitation. Sure it is true that there’s a lot of variability on the ground, that it’s impossible to reproduce. If you want to get an answer on a trend in the future, one of the ways you go about that is using what’s present right now and then you scale it with the physiological response of the plant and the fly in the future. That way you get an answer that is valid across the Mediterranean basin. In terms of the drier summers that you mentioned, what we assumed is that the changes in temperature and the limitations that this change will exert on yield will not be cancelled by having additional irrigation water as I told you before, because no matter how much water you have, you reach a point where the plant cannot produce more yield just by the fact that you have more water, because it’s a matter of the temperature increase. Curtis Cord As farmers follow the money, abandoning groves in some areas, you’re concerned that those regions will be vulnerable to fires, erosion and the loss of biodiversity. How does that happen? Luigi Ponti Yeah. The main problem with that is that even smaller changes in profit will be relevant in places that are already economically and environmentally marginal, because they kind of experience already a trend of abandonment. People if they find a better option, they do a different job because it’s more rewarding. Those olive groves are also the ones that are more important in terms of environmental stewardship. Regardless of the fact that they’re not very rewarding in terms of the profit the farmer make, they are very important environmentally in terms of preserving the soil and protecting biodiversity, because they are usually on steep land, when you abandon an olive grove the vegetation that results and colonizes the land is more prone to fire because the vegetation is no longer managed. These are the kind of problem that may occur. This is also the reason why in Europe especially we have common agricultural policy that sustains those kind of farmers that are in marginal environments and implements ecologically friendly ways of practicing agriculture. We pay farmers for the services that they provide to the rest of the community because we know that the margins in terms of the market are low, but we know they’re very important environmentally and ecologically. Curtis Cord We talk about climate change in a futuristic sense it seems to me, but as you know some olive farms have been passed down through countless generations within a family. When we are looking at major changes in weather conditions by 2050 or 2060, we’re talking about the very next generation. Some the children already helping with the harvest will be facing these changed conditions before they know it. Which of these farmers I wonder will be the ones the walk away from the olive farm? I can see the olive industry, like so many others, consolidating as environmental pressures mount. Less smaller farms and production is much more centralized. I know you worry about the cultural impact and the loss of a way of life if that happens because I previewed a chapter you wrote for a soon to be published book titled “Bio-cultural diversity in Europe.” Your chapter title is “Preserving the Mediterranean diet through holistic strategies for the conservation of traditional farming systems.” There you wrote, “The challenge in small to large farm is to reinstate social organization and collective strategies in farmer communities that make full use of holistic knowledge about food systems.” What are some example of changes you might see communities adopt armed with data from the analyses you and your team are conduction? Luigi Ponti What happens is that at a certain point, once you know that the more environmentally important farms will suffer first from climate change, they’re also the most vulnerable, there has to be political action to address that. That can also come from organization of farmers but it will not come from the market alone. We have to realize that there are things that will not occur just because they’re driven by market forces. There are things that are not appreciated, like externalities, ecosystem services that agriculture provides, the conservation value of agriculture, that are not currently appreciated by the market. There’s not a price tag on that, only by collective action you can move toward that direction. It’s not only my study that indicated that direction, there’s a lot of evidence showing that. For example for olive, a lot of what’s going on ecologically, even in the more intensive agricultural fields like the market rewarding crops, depends on the biodiversity that surrounds it, even below ground. Which means that the land that is managed less intensively, like it would be olive groves or the agroforestry systems that are abundant in the southern Mediterranean basin that I mentioned in my chapter, that resembles savannas. The below ground diversity, at the microbial level, they exert functions that are vital to maintain the functionality of the more productive land that is embedded in the same landscape. The evidence is growing of that and we need to realize that. We need to pinpoint that in order for the diversity of the landscape to survive, because then the market value you get it from the cash crop but you know you can get that yield because it’s embedded in an agricultural landscape that features different elements. Many of these elements are not rewarding in terms of the market but are vital in terms of the functionality of the ecosystem. One of these elements is probably olive, there is one thing that I say in the paper, that has been shown in a couple of papers, that below ground biodiversity is as important as the above ground biodiversity in terms of the productivity and maintaining the productivity and increasing the resilience of ecosystems and entire landscape to climate change. One thing that is important to keep in mind is that when we think of agriculture and climate change, we think of landscapes. We have to think or relationships between the above ground and below ground biodiversity, that they interact using the plant as a connector. When you want to do something useful in term of the climate change, especially that is useful for farmers, you have to build in resiliency in the system and you do that by increasing also the below ground biodiversity, then of course by diversifying the landscape, and then of course by keeping in the landscape key elements like traditional perennial farming systems like olive for example in the Mediterranean. Which is even isolated trees or small groves still resist throughout the Mediterranean. It’s like a fabric that unites all the landscape of the Mediterranean and has probably an ecological function that we still have to uncover, but the first evidence is coming up and it’s clear what is the pattern. Olive grove systems in the Mediterranean basin were developed over the course of centuries in an interaction of people, the land system and the climate to resist a certain kind of pattern that has probably already learned to deal with drought in the past because that’s embedded in the Mediterranean climate. It rains very sparsely and every couple of year probably if you’re lucky. They’re already doing that in the field, what they did, they made something that is very ecologically sensible. If you look at the ecological literature you see that to build a sustainable agricultural system you need to reproduce certain elements of the natural vegetation. Usually your first and better bet would be to look at the primary natural vegetation, the secondary natural vegetation which is what regrows after you cut down the primary forest, which probably in the Mediterranean doesn’t exist anymore unless you go to some remote place. But it’s very rare to encounter the primitive vegetation that was here. It’s a landscape and a region that has experienced very deep interaction with the human system. The olive tree, you also find in the secondary forest in the Mediterranean basin. It’s a natural system if you look at it closely, because it’s what you find also in the forest that is next to the cultivated field in the end. It makes ecological sense to have it there. The kind of fertility that develops in the soil after centuries of having olive groves there, it’s very different than if you plant an olive tree today. Curtis Cord Making meaningful changes require forward thinking community planners and politicians. In my country we can’t even stop people from buying assault rifles over the Internet. What are the chances communities can look forward forty years and make meaningful changes to preserve biodiversity and a fast disappearing Mediterranean way of life? Luigi Ponti Yeah, this is a very important question, thank you. The key message I wanted to give was that because I started from the statement that the Mediterranean diet was recently added to the list of the cultural heritage of humanity. Everybody speaks about the Mediterranean diet these days in Italy and in Europe and probably across the world as a lifestyle that is healthy and so on. But together with that we need to understand that dietary pattern emerged from a agricultural system. It’s the array of crops that are on the ground and the way people farm the land for centuries that gave as a result the dietary pattern that we today call the Mediterranean diet. It’s kind of well conserved across the Mediterranean basin. If we don’t make any effort to conserve what’s still there in terms of cultural practices and traditional knowledge and the way people farm the land and traditional varieties and the landscape, and the way we maintain the lands in the form it is right now, it would be a waste of time to just promote the Mediterranean diet simply as a set of recipes that we find in a book and we try to make ourself in our kitchen. Because UNESCO said that already, when describing what the Mediterranean diet is. The agricultural part is embedded. Yes it’s embedded but it’s disappearing and we have to make efforts to conserve that. That’s why I mentioned in the chapter a very important FAO initiative that is called Globally Globally Important Agricultural Heritage systems (GIAHS). That is sort of what UNESCO does but agriculturally. They try to select across the world agricultural systems that are run by local people that are irreproducible, which means that if they go away it will take another say one thousand years to redevelop the level of knowledge and management that they currently have. This is at least partly too for olive groves in the Mediterranean basin, I think. 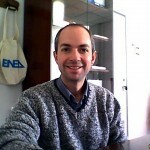 Curtis Cord Luigi Ponti is a research scientist for the National Agency for New Technologies, Energy and Sustainable Economic Development in Rome, Italy. Luigi thank you for an interesting discussion today. Luigi Ponti You’re welcome, thank you for the interview. Nice to talk to you, Curtis.